Don’t leave without having bought some of Florina’s exquisite local products, such as Florina red peppers, Prespes beans, mountain tea, spoon sweets and knitted candles made from skillful local candle makers. Last but not least, the ski aficionados can slide down snowy slopes at the Vigla Ski Center at the village of Pisoderi (19 km far from Florina, at an altitude of 1.600-1900 m). - Florina's Fires at midnight on December 23rd at Eroon square. - The "Leyistia" are held during the first ten days in August. Only 45 km west of Florina, on the borders with FYROM and Albania, lies one of the most important habitats in Greece and the first transboundary protected area in the Balkans. The Prespes National Park is a wetland with rich bio-diversity, whose core covers an area of 4,900 Km2. The wealth of this bio-diversity is perfectly demonstrated by the fact that more than half of birds, amphibians and mammals species found in Greece are encountered here; besides, 9 out of the 23 fish species living in its waters are endemic. A large part of the Prespa National Park was also included in the NATURA 2000 network of protected areas. The Megali (Big) Prespa Lake is the aquatic border between three countries, with its largest part belonging to FYROM. Its waters communicate with the waters of Mykri (Small) Prespa, from which it is separated by a narrow silted strip of land. The Mikri Prespa belongs almost exclusively to Greece, since the latter shares only a very small part of it with Albania; it also boasts two islets: Áyios Ahillios and Vidronisi. On the banks of Megali Prespa you will encounter the traditional village of Psarades, where you can admire traditional houses of Macedonian architecture. Indulge your palate in freshwater fish served by the lake-side tavernas. Rent a boat to take a cruise around the lake and admire the one of their kind “askitaria” (hermit cells) with their stunning 14th-15th century rock paintings. 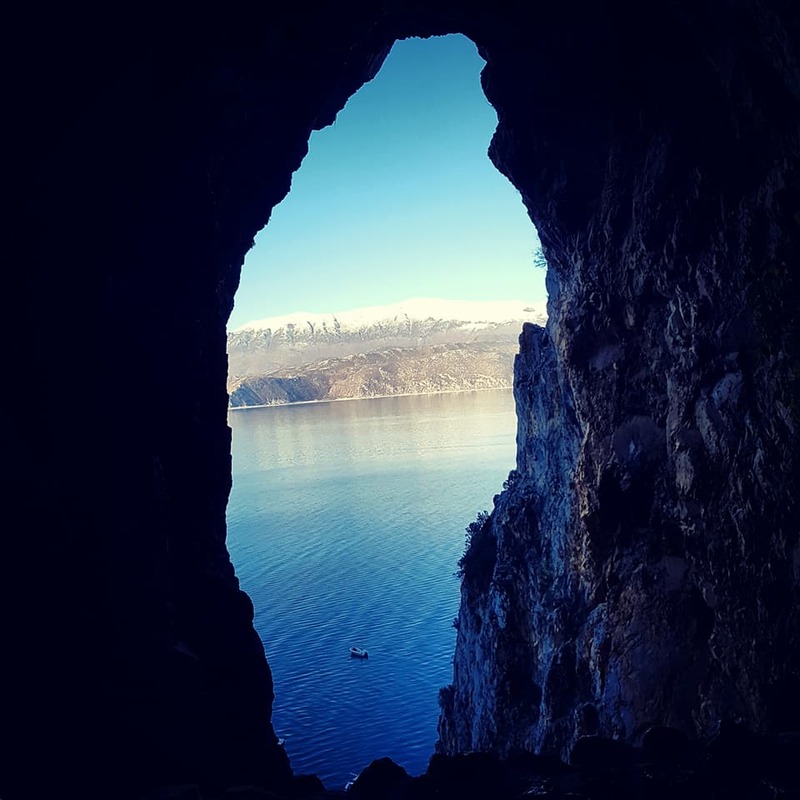 During the Ottoman Empire the natural beauty and isolation of the area attracted many monks who built their hermitages along the shore of the Lake. South of Psarades, on the NW side of Mikri Prespa Lake, lies the islet of Agios Achilleios, one of the most picturesque places in Northern Greece connected to the shore with a 650 m long floating bridge. It is of the inhabited islands on a lake in Greece, particularly renowned for its Byzantine monuments, among which stands out the three-aisled basilica of Agios Achilleios. Don’t miss “Prespia”, the colourful cultural celebrations held during the third quarter of August on the island! Agios Germanos and the other Prespes villages boasting old churches and traditional stone-built houses are precious gems that also are worth visiting; they are divided in the villages of Pano Prespa Lake (Pylos, Pyxos, and Vrontero) and Kato Prespa Lake (Laimos, Miliona, Plati, Kallithea, Lefkonas, Karyes, Oxia, and Mikrolimni). Only 53 km far from Florina you will find an outstanding stone settlement perched on the east side of Mt Vitsi, at an altitude of 1,346 m. The village flourished significantly between the 17th and 19th century, when it was an important centre of gold and silver trade, while its inhabitants were prominent merchants abroad. For many years the settlement had been abandoned but thanks to a coordinated effort from local people and the state, it managed to regain its lost glory. Today it forms one of the most impressive officially proclaimed by the Ministry of Culture and Tourism traditional settlements. 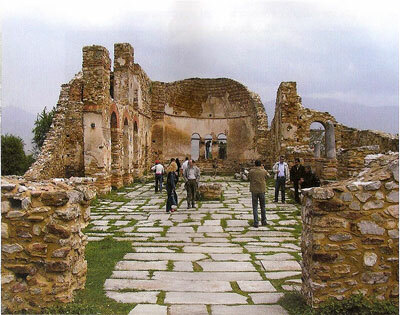 Located in the northeastern part of the homonymous island of Lake Prespa.The church was founded from the Tsar Bulgarian Samuel the 983 or 986 A.C who after his victory against Byzantine and the occupation of Larissa , transports from there there relics of Saint Achilles in Prespa.Despite the repeated destruction and looting of the church the locals rebuid it and continue to use it as the main center of worship until the mid-15th century.. The church belongs to the type of aisle basilica with three naves , seperated by two pessaries-arrays , which each of them counts seven pillars.Interesting architectural element are the steps used in official ceremonies the senior priests , most of which have survived and samples from the oldest wall paintings depicting red eighteen arches still showing the seats of bishops who belonged to the Archdiocese Ohrid.Also from other layers of wall paintings have been preserved forms of military saints , the Virgin Mary and an angel , which date from the 11th and 12th century. Interest presents the tombs of important persons are in the southern nave of the temple.In the south antennaof the diakonikon there is a tomb covered by anaglyph limestone slab , which according to tradition are kept the relics of Saint Achilles.Of the other four graves of the south aisle stands in which he found a silk fabric piece , depicting eagles in circles decorated with plant motifs. From Psarades, the little village smack dab in the middle of Megali (Big) Prespa, you can set out in a small boat for a different kind of voyage. The natural beauty, along with its remote location, attracted many monks during the Ottoman occupation, who built their hermitages along the shores of the bigger lake. Today these small monastic structures, as well as the rock frescoes from the 14th to 16th century, are attractions that will give you an insight into another era. The boat is moored at a modest jetty at the base of the rock. Leap out and start exploring. How about an excursion to the beautiful village of Nimfeo? You can meet there all the bears that are hosted by ARCTUROS and that are hedged in a specific area of 50,000 m2 with an altitude of 1,350 m. It is an unforgettable experience! You can be informed about the development of the brown bear, its geographical distribution, its biology, ecology and about the danger of its species as well as about ways of tackling them, at the historically significant building of Nikiios School at Nimfeo. This program is aimed at people of every age and is a very fun as well as educating experience for children. Have you ever been to Agrapidies, Florina? Here’s your chance! This sanctuary was created in order to put an end to the phenomenon of illegal possession of wolves. 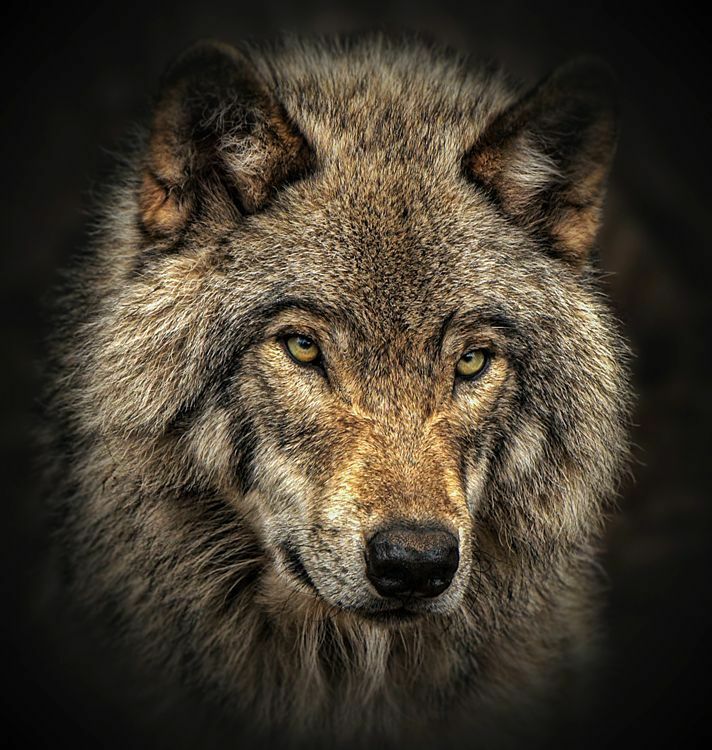 All the wolves that could be rescued are hosted, hedged in a part of the natural 70,000 m2 oak forest. You might not easily spot them but they would have definitely already sensed you! 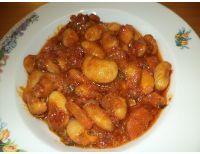 The local cuisine include exceptional dishes made with mushrooms,meats,cheeses and organic products.The homemade products like jams and sweets, also and the local drinks such as raki, is famous throughout the region.